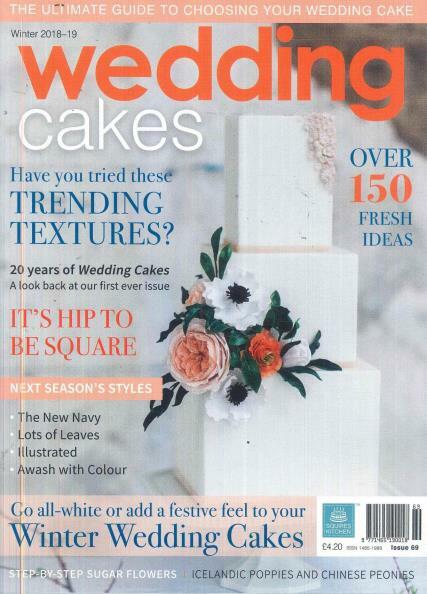 Wedding Cakes is the ultimate in wedding cake choosing, baking and decorating magazine. It includes photo spreads that make all cakes look awesome and so beautiful that they don’t look like icing and flour. They all look too good to eat. If you are a bride-to-be who wants to make her own cake, Wedding Cakes Magazine would be perfect for you. More than just cakes in each issue. You can find ideas for wedding favors using cake, and there are tips and tricks on keeping you cake preserved. One issue of Wedding Cake Magazine features the top destinations for honeymoons, and were to buy the ultimate wedding dress. Designers of wedding cakes abound around the world and the top designers are listed in Wedding Cakes. You won’t find any magazine more beautiful than this one if you are planning a wedding.You must not have a cake designed or purchase a wedding cake until you look though the glossy pages of this magazine. You will find ideas that are unique, one of a kind, and just plain tradition.